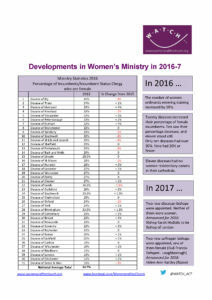 Following our publishing of the Diocesan League Table of Female Incumbents (which can be accessed by clicking HERE), WATCH has recently published a table showing the movement between 2016 and 2017 in the percentage of incumbents/incumbent status clergy who are female. You will note that the Diocese of Ely top the list with 40% of incumbents/incumbent status clergy who are female, which is a slight reduction over the 2016 figure. Bottom of the list is Sodor and Man with only 11%. There are 6 diocese with less than 20% incumbents/incumbent status clergy who are female.